Located in the heart of Pennington, Amber Spa is a holistic day spa offering a variety of specialty services catering to your body and skin care needs. We offer microdermabrasion treatments as well as anti-aging treatments. Our trained technicians use a combination of custom blends and botanicals to keep your skin looking young and healthy. We are also happy to offer hair removal, nail care, massage therapy, body treatments, bronzing treatments, and Lavish Lashes - a semi-permanent lash extension that is water resistant and worry free. Our hot stone massage provides heat penetration and relief from physical pain. 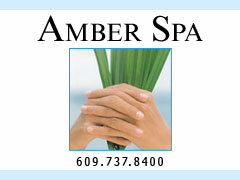 Which ever you choose, you are sure to improve your spiritual, physical and mental well-being here at Amber Spa. We are proud to carry a variety of skin care product lines such as: Skin Ceuticals, Yonka, MD Skin care, Boscia, Nuxe, Payot, Mustela, Z. Bagatti, B. Kamins, Peter Thomas Roth and Mineral Makeup. Gift certificates also available. Shop Folica.com for hair flat iron, chi flat iron and hair dryer. If you are considering cosmetic surgery you’ve come to the right place. Princeton surgeon Thomas A. Leach, M.D. has been performing plastic surgery of the face, breast and body for over 16 years. Certified by the American board of Plastic and Surgeons, Dr. Leach has been recognized on ‘Top Doctor’ lists in several publications over the years and chosen as a Castle Connolly Top Doctor for the last 7. Or simply make an appointment with our Medispa which offers you the latest in facial rejuvenation using the finest skin care products.